The reason why I used the 'Dr. Evil'-like quotes above because the Skywrighter is not a 'news' paper in the traditional sense of the word. Yes, it does look an awful lot like one (this publication utilizes a 3-section broadsheet format) but within military circles, the transfer of information to its eventual consumers is done through a public affairs office instead of an actual news-gathering organization seen in civilian circles. 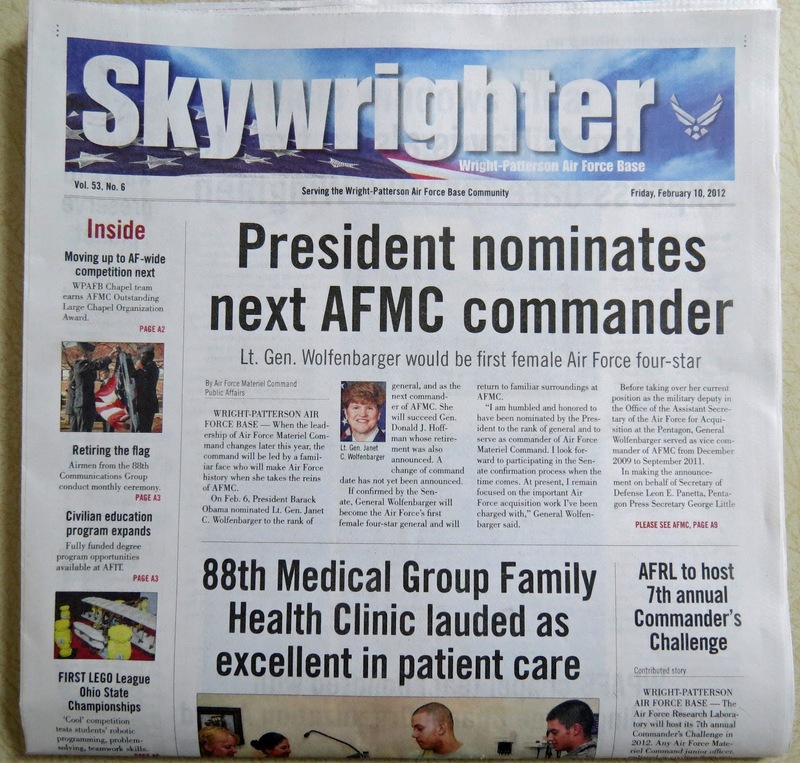 At Wright-Patterson, the 88th Air Base Wing has overall responsibility for the review and approval of information that is released to the media through official news releases and postings to the base's web site. The Current Operations division of the Public Affairs Office liaises with local, regional, national and international news media and responds to media queries, writes news releases on significant events, arranges interviews with spokespersons and coordinates other activities to enhance the relationship with members of the press. 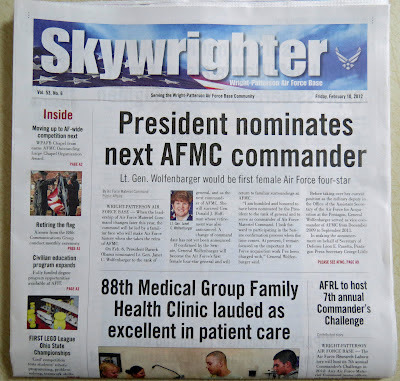 The publication of the Skywrighter is contracted out to Cox Media Ohio, who is responsible for the layout, printing and distribution of 16,000 free copies to various venues throughout the installation and to several off-base locations in surrounding communities. An electronic copy of the publication is posted online along with an archive collection that dates back to November 2009. While I do make a distinction between a news operation and a public affairs office, I don't want to slight the men and women who are performing journalism-related duties within this and other military organizations. Both commissioned and enlisted members of the US Armed Forces selected to fill these roles attend the Defense Information School, or DINFOS, located at Fort George G. Meade, Maryland. While there, these students are exposed to a wide variety of subjects, to include training in public affairs, print journalism, photojournalism, photography, television and radio broadcasting, lithography, equipment maintenance and various forms of multimedia to handle the demands placed upon 21st century military journalists. Due to the high visibility and many demands of the position, working in an Air Force Public Affairs Office is considered 'special duty' and required a stringent vetting process to ensure that only the highest quality candidates were chosen. I don't recall offhand why I never applied for this duty during my career but it would be something I would definitely consider if given the opportunity.